source: a 366-swatch perpetual desk-calendar. yarn: Lion Brand 'fishermans wool', currently 4x400yds on-hand. I'll need a bit of some contrasting colour for a couple of the swatches, I'll rummage through my scraps-bin when I get to those. 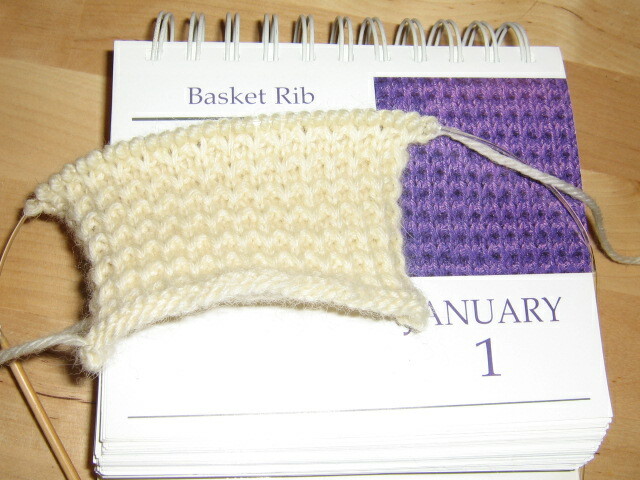 swatch size: having looked through the entire calendar, the biggest swatches will need a 30-stitch and/or 30-row format, so I'm making them all that 30x30 size; this results in a swatch that's about 4" wide by 3" high on these needles. layout:...and then doing more maths, the best way to arrange the resulting mountain of knitting will be to knit the swatches in strips of 28 (because although I am quite clearly mad, I'm not mad enough to set myself up for that much sewing-together) and then seam these strips together; 28 times 3"-high by 13 times 4"-wide should come out to about 4 feet by 7 feet, with two swatches left over in case of whatever contingency may arise (IE encounters with purple soda, or general un-knit-ability). How to Be Parisian Wherever You Are: Love, Style, and Bad Habits, Anne Berest et al. Wow! I half want to run screaming and half want to knit along with you. Well, not in wool. But. Good luck with this progect.